AirFly from Twelve South lets you use your AirPods or wireless headphones with any wired headphone jack. Say you are on an airplane with in-flight movies or TV—with AirPlay, you can listen wirelessly. 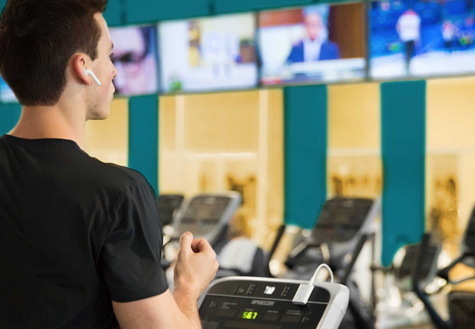 If you spend time on a treadmill or stationary bike at the gym, you can listen to TV with your AirPods. The new AirFly is a tiny Bluetooth device smaller than a box of matches (remember them?) and weighs just half an ounce (15.6g). Plug any audio source into its 3.5mm socket and once paired with your AirPods or Bluetooth headphones, you can listen wirelessly. Even though AirFly is small, it contains a rechargeable battery that provides power for about eight hours of listening. Pairing your AirPods is a snap and AirFly remembers them so the next time you use them, connecting is simplified. AirFly is packaged with two 6 inch (15.5CM) cables. One is for charging from any USB charger and the other is a 3.5mm-to-3.5mm audio cable. These cables are short to eliminate cable clutter when in use. As an experiment, I plugged AirFly into our TV. There are times when Jack wants to watch sports while Jill prefers silence. Watching TV via AirPods is a terrific solution. I asked Twelve South if AirFly could be permanently connected to a charger and parked behind our TV. The answer is yes but the on-off/pairing button needs to be accessible. See below, it’s inconspicuous but readily available. If you have a home entertainment system with an old-school receiver, you can now listen wirelessly. AirFly has a few limited uses but if one of them fits your needs, it is a handy gadget to have on hand. It’s not for everyone but it’s priced well, connects easily, and packs in a convenient drawstring pouch.